For the Outer Limits episode, see Counterweight (The Outer Limits). Counterweights are often used in traction lifts (elevators), cranes and funfair rides. In these applications, the expected load multiplied by the distance that load will be spaced from the central support (called the "tipping point") must be equal to the counterweight's mass times its distance from the tipping point in order to prevent over-balancing either side. This distance times mass is called the load moment. A counterbalance is a weight or force that balances or offsets another as when two objects of equal weight, power, or influence are acting in opposition to each other. The objects are then said to be in counterbalance. Trebuchet: There are five major components of a trebuchet: beam, counterweight, frame, guide chute, and sling. After the counterweight drops from a platform on the frame, gravity pulls the counterweight and pivots the beam. Without the counterweight, the beam could not complete the arc that allows the sling to accurately release the projectile. Crankshaft: A counterweight is also used in many rotating systems to reduce vibrations due to imbalances in the rotating assembly. A typical example is counterweights on crankshafts in piston engines. Desk lamp: Some balanced arm lamps work with a counterweight to keep the arm and lamp in the desired position. César Pelli's Ratner Athletic Center uses cables, masts and underground counterweights as a load-bearing support structure. Leaning Tower of Pisa has used external counterweights to stabilize the once gradually falling structure. Elevator: In traction (non-hydraulic) elevators, a heavy counterweight counterbalances the load of the elevator carriage, so the motor lifts much less of the carriage's weight (specifically, the counterweight is the weight of the carriage plus 40-50% of its rated capacity). The counterweight also increases the ascending acceleration force and decreases the descending acceleration force to reduce the amount of power needed by the motor. The elevator carriage and the counterweights both have wheel roller guides attached to them to prevent irregular movement and provide a smoother ride for the passengers. Space elevator with counterweight at top. Space elevator: A space elevator is a proposed structure designed to transport material from a celestial body's surface into space. Many variants have been proposed, but the concept most often refers to an elevator that reaches from the surface of the Earth to geostationary outer space, with a counterweight attached at its outer end. By attaching a counterweight at the end, upward centrifugal force from the Earth's rotation ensures that the cable remains stretched taut, countering the gravitational pull on the lower sections and thereby allowing the elevator to remain upright. Metronome: A wind-up mechanical metronome has an adjustable weight and spring mechanism that allows the speed to be adjusted by placement of the weight on the spindle. The tempo speed is decreased by moving the weight to a higher spindle marking or increased by moving it to a lower marking. 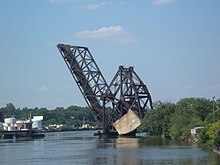 Crane: The tower crane (see picture) is a modern form of balance crane that is fixed to the ground. A horizontal boom is balanced asymmetrically across the top of the tower. The long arm carries the lifting gear. The short arm is called the machinery arm; this holds the motors and electronics to operate the crane, as well as the concrete counterweights. ^ "Basic Crane Design principles". E-Crane International. 2002. ^ "How a Trebuchet Catapult Works". Retrieved 2007-04-07. ^ "How does a catapult work?". 2000-04-01. Retrieved 2007-04-07. ^ "Understanding Crankshaft Balancing - Engine Builder Magazine". Engine Builder Magazine. 12 May 2009. Retrieved 28 June 2018. ^ Bellis, Mary. 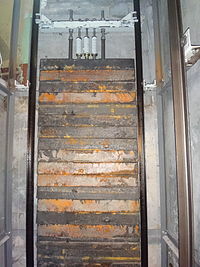 "The History of the Elevator". Retrieved 2007-04-07. ^ Metronome. Wikipedia. Accessed 7 April 2007. ^ Crane (machine). Wikipedia. Accessed 7 April 2007. ^ Brain, Marshall. "How Tower Cranes Work". Retrieved 2007-04-07.